For as long as there has been theatre, there have been people trying to put into writing their experience of it. 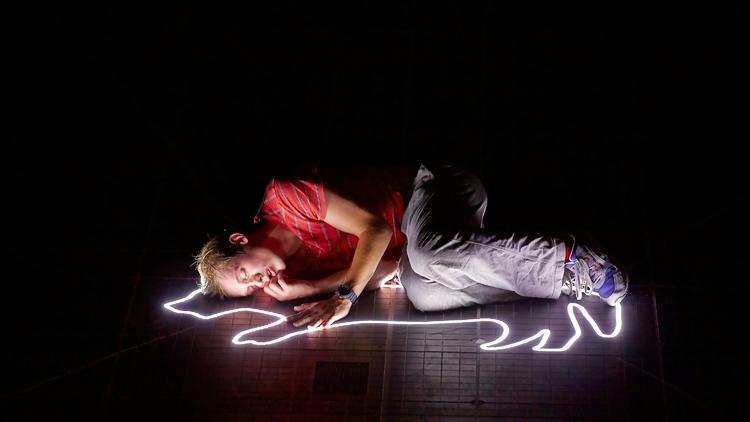 Here I am going to attempt to express what I thought of the play The Curious Incident of the Dog in the Night-Time, which I went to see when it came to Edinburgh earlier this year. It’s a play I believe everybody should watch, raising important questions about what it means to be human, how we experience the world around us and value those close to us…whether truth is always the best solution. But I encounter the same problem as every writer before me – how do I possibly do a physical performance justice on paper? Playwright Simon Stephens’ adaptation of the novel must simply be experienced on a stage to be fully appreciated. Here, I present you: a novice critic’s view. The production opens with a boy kneeling next to a dead dog and a woman screaming. This is the audience’s first introduction to Christopher (played here by Joshua Jenkins). The audience soon realizes that Christopher has been unjustly accused of the killing, but his behaviour still seems slightly unusual. He always tells the truth and has a natural ability with numbers, but is unable to understand metaphors or empathise with others – and he does not like to be touched. Provokingly, the word “autism” is never mentioned in the play, yet these traits convincingly suggest Christopher is on the autistic spectrum. Jenkins portrays this meticulously and realistically, never overplaying the role, but allowing the audience insight into Christopher’s manner of thinking. He is able to make the audience laugh at a swear word, and then soon after evoke genuine empathy upon the discovery of a dark secret hidden in his father’s bedroom. “It is not a play about disability, but rather a play about difference”, says Marianne Elliott, the show’s director. The audience accompanies Christopher on his journey, and begins to better understand his unexpected and anti-social behaviours. In a way that evokes Christopher’s mathematical way of thinking, the play’s staging places the actors inside the four panels of a giant cube, representing Christopher’s mind as it literally places the audience inside his head so we see the world through his eyes. This box is also a giant chalkboard upon which Jenkins draws facial expressions associated with basic emotions like “sad,” “happy” and “cross” – facial expressions his character does not fully comprehend. This blank, abstract set allows the audience to be transported to different locations, that may be real or imaginary, and sometimes both; we are enclosed intimately within Christopher’s perspective, allowing the play to work through the puzzle of its own plot as rapidly as Christopher’s mind does. For example, the multi-sensory approach of the very talented sound, lighting and graphic departments allows the audience to experience Christopher’s inability to filter out the constant stream of information it is receiving. At times, such as one particular scene in a train station, these effects can become overwhelming, and the mixture of noise, strobe lighting and rapid movement on stage, enables the audience to empathise with and even experience themselves, the extent of Christopher’s fear and disorientation. In addition to this, the use of projection throughout the play is breathtaking, from recreating the hustle and bustle of the London underground to creations of Christopher’s own imagination, such as his exploration of intergalactic space. In this scene, the ensemble cast are intricately choreographed, going almost unnoticed – and are yet crucial to the audience’s experience. As Jenkins recites his lines about space, he is slowly lifted into the air by the ensemble, turned and twisted, and helped to take huge jumping strides across the stage – creating the illusion that gravity has disappeared altogether. The use of repeated cast and their characterization is highly symbolic; Christopher’s closest friend is his teacher Siobhan. In the novel she reads his book, but in the play she represents three different characters; Christopher’s teacher, the narrator, and also Christopher’s body at some points. She acts as the bridge between Christopher’s narrative and the audience in this dramatic irony. Therefore, it is not just me who finds myself asking questions about performance as I put it in writing: the play is all about what the nature of performance really is, what communication with each other really consists of, and how it makes us feel the way we do. In Christopher’s quiet moments of epiphany and poetic articulation, the way we think about all art forms is challenged – and who can make art in the first place. This play cannot fail to move even the stoniest of hearts – the emotion is raw and real, and allows real life to unfold in front of the audience’s eyes. It’s an absolute must-see. Christina Intrator is amongst other things a medic. She loves percussion (ranging from pots & pans to proper djembes), long road trips no matter the destination and most importantly poetry slams! Although one would assume a 3rd year medic to always be at the Royal Infirmary, Christina spends a lot of time elsewhere – from the ball court in Dalry to Varsity Music shop on South Bridge – you will no doubt bump into her when you least expect it. I read this article and found it very interesting, thought it might be something for you. The article is called A Novice Critic’s View: The Curious Incident of the Dog in the Night-Time and is located at http://prancingthroughlife.com/2015/11/12/a-novice-critics-view-the-curious-incident-of-the-dog-in-the-night-time/.